With Bluegrass from Wales, England & Italy, showcase concert for Young Bluegrassers and the beautiful scenery of North Wales the Coastline Bluegrass event has all the right ingredients. The name of the event is misleading but the festival brought their name with them when the event moved from Conway (on the Nort Wales coastline) to their new home in Llangollen. Llangollen has a very long tradition of music and culture and is the home of the International Eisteddfod which, as their website says, is where Wales welcomes the world; Llangollen has also hosted the National Eisteddfod. Coastline Bluegrass will take place between the 29th and 31st of May and, recognising that this is a time when children are out of school, young people under 16 years old have free entrance (when accompanied by a paying adult). Talking to John Prytherch of Coastline Bluegrass he explained that they also have a Young Bluegrassers concert which is co-ordinated by Stuart Williams bringing young Bluegrass musicians from the region to the stage. Stuart was awarded the Jan Jerrold Award by the British Bluegrass Music Association (BBMA) for what he has done to support, encourage and develop young people to become involved with Bluegrass. Editor's Note: A more detailed article discussing the grass-roots development of youth Bluegrass is being planned. I would like any festival or organisation within Europe which has a program to bring young people into Bluegrass to email me. But let's get back to Coastline Bluegrass... on the lineup (and from the UK) are Bakers' Fabulous Boys, Blossom Hill, the Whitefern Mountain String Band, The Grass Snakes as well as the fabulous Kentucky Cow Tippers. 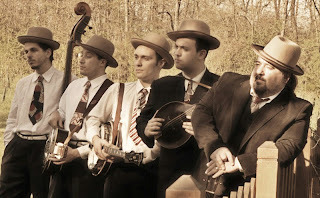 Headlining, from Italy, are Ruben & Matt and the Truffle Valley Boys who (as suggested by their picture below) play traditional-style Bluegrass. Lastly, in the event of poor weather, Coastline Bluegrass are able readily able to continue proceedings under cover and if you get chance, and if the water is 'good', take a stroll to the Llangollen bridge and watch the kayaks - impressive water there.